Men’s black track jacket from Y-3, a collaborative label between adidas and Japanese avant-garde fashion designer, Yohji Yamamoto. Evoking the designs from the early years of Y-3, the sleek track jacket has raglan sleeves trimmed with tonal 3-Stripes tape on the right side and contrasting white 3-Stripes tape on the left side. Fastened with a two-way zip closure concealed by a snap-button storm flap, the jacket is detailed with snap fastened welt pockets and a convertible collar that can be worn up or folded down to show the soft interior. The inside of the jacket is lined with breathable mesh and features two welt pockets. 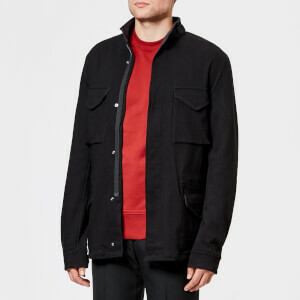 Complete with a tonal Y-3 logo on the upper back, ribbed trims and thumb holes on the cuffs. Main: 53% Cotton, 47% Polyamide. Lining: 100% Recycled Polyester. Rib: 90% Polyester, 10% Polyurethane.